It is easy to install and modify according to your purposes and tastes. It is an open-source technology that helps to find flexible eCommerce solutions. It is able to save your money. It offers nearly 50 payment gateways. If you want to speed up your Magento online store, try to use a CDN service. Find the detailed instructions how to integrate CDN with Magento below. Using the left menu go to Stores → Configuration. Using the sub-menu go to General → Web. 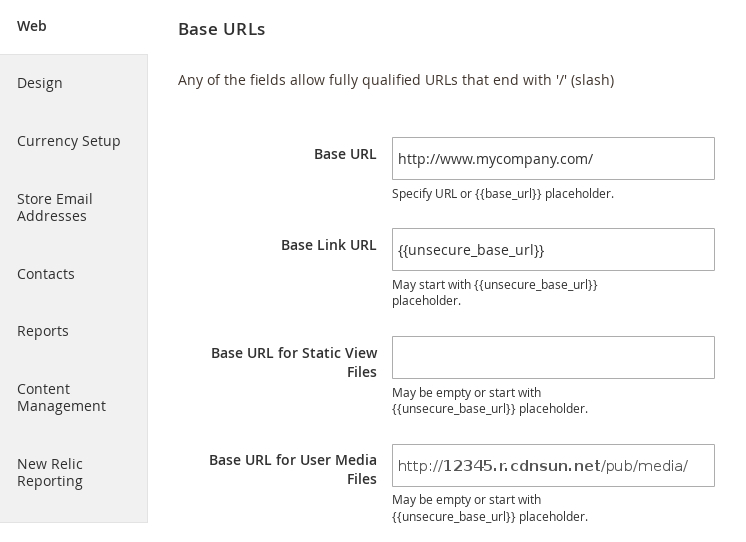 Open the Base URLs section. To the Base URL for User Media Files input field fill in http://12345.r.cdnsun.net/pub/media/ as in the picture below. Using the left side menu go to System → Cache Management. Refresh all caches which are out-of-date or simply click on the Flush Magento Cache button. Using the top menu go to System → Configuration. Using the left menu go to General → Web. To the Base Skin URL input field fill in http://12345.r.cdnsun.net/skin/ and to the Base Media URL input field fill in http://12345.r.cdnsun.net/media/ as in the picture below.